This was just a fun card to make. I played with die cutting, stamping and ink smooshing. Extra Details: I began this card with a panel of water color paper. 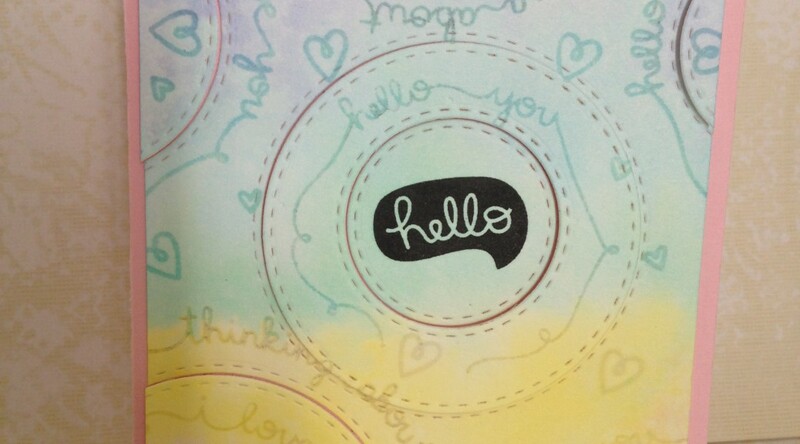 Using my circle dies as a guide, I curved my sentiment stamps on my MISTI. Then, I stamped them on the water color paper with Simon Says Stamps Barely Beige ink. I filled in the open areas with some small hearts. I added the hello speech bubble with black ink to make it really stand out. Then, I smooshed 5 colors of Distress Ink onto a large acrylic block in rows. I misted the block with water and put it on the stamped panel. I let the block sit for about 5 minutes before moving it. Then I let the panel completely air dry. I used the circle dies to create some interest in the panel. I adhered the large piece to pink card base. I used foam tape to pop up the next layers of the circles. If there was a third layer, I adhered that flat to the card base.